The Professional Regulation Commission and the board of Pharmacy announces that 937 out of 1,759 passed the Pharmacist Licensure Examination on January 2014. GoodFilipino.com speculated that the exam results will be available after three working days, after the last day of examinations. PRC and board of Pharmacy given the written exam to the testing centers in the cities of Manila, Cebu, Baguio, Davao and Iloilo City, last January 12 and 13, 2014. Aside from the complete list of passers, the Top 10 Passers, Top Performing and Performance of Schools will be added here also as soon as release online. Last year, the Pharmacist exam results was released in two (2) working days since the last day of exam, with a total of 1,181 examiners but only 641 successfully passed the examination. For the meantime, If you feel that this story are informative, please bookmark it now or visit this site more often for you to be updated. You may also share this post to your friends so they may know about Pharmacist Board Exam Results Released (January 2014). 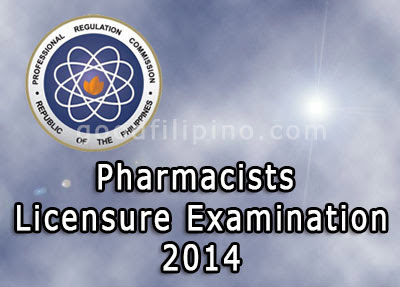 Comments or suggestions about "PRC: Pharmacist Board Exam Results Released (January 2014)" is important to us, you may share it by using the comment box below.